How do you make money writing? Many successful freelance writers are full-time writers (like me). They are making a stable income (or a growing income) and have no challenge finding clients or getting projects. But, there are even more writers that barely make enough money to replace their sucky dead-end job. They are struggling, and they have no idea how to get away from crappy freelance writing projects. Writing for money is something you might be thinking and wanting to do. Let me tell you – I was one of those writers. 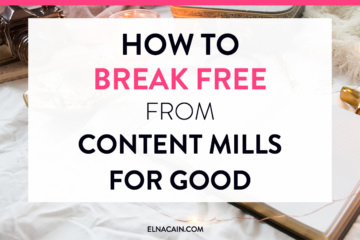 I had no idea what I was doing and ended up landing a content mill gig. Yes, I was one of those writers….. But, I changed all that and discovered a whole new world of freelance writers. I found that there are writers that attracted clients. Writers that landed gigs all the time and writers that demanded a high paying rate. OMG…I had to be one of those writers. And you know what? I AM one of those successful writers. I don’t worry any more about my monthly income. My husband and I can take off any day out of the week to go on a mini road trip. If you want that too, here’s how you can make money as a freelance writer. Yes. You need a blog if you want to be a wealthy freelance writer. A blog can serve so many things besides a portfolio. A blog is perfect for anyone wanting to start a business. Whether it’s a coaching business or graphic designing or writing, a blog can serve as a platform for your business. And you know what? It’s not hard to start a blog these days. I personally love Bluehost to start a service-based business blog. They are reputable, helpful and time-saving. If you need more help, check out this post. I have a video tutorial in that post. When you have your freelance writing blog, you can set up your site to be a service-based site. This means having certain pages on your site (your menu items). This can definitely help you make money writing. Testimonials page – this is optional. You can place your testimonials on other pages. Contact page – have a way to contact you via a contact form or links to your social media profiles, Skype and/or email. Blog – link to your blog roll. When you have a blog, you can make money writing by monetizing it. This means you can have ads, sponsored posts or do affiliate marketing. I suggest affiliate marketing if your site is new. The other ways need more traffic and connections. I monetize this blog with some affiliate links, and for me, it’s a nice side hustle. To get started on how to make money writing on your blog, I suggest you pick a tool or service that you are using or know about. You can also choose to promote a course if they offer an affiliate program. You can search on Google if a product or service has an affiliate program. So, while you’re building up your portfolio with samples from your blog, you can also try to earn a couple of bucks by placing affiliate links in your posts. I suggest, however, to create a tutorial based post based on your affiliate product. This has a much higher conversion rate. On the flipside, your blog can attract prospects when it’s part of your writer website. 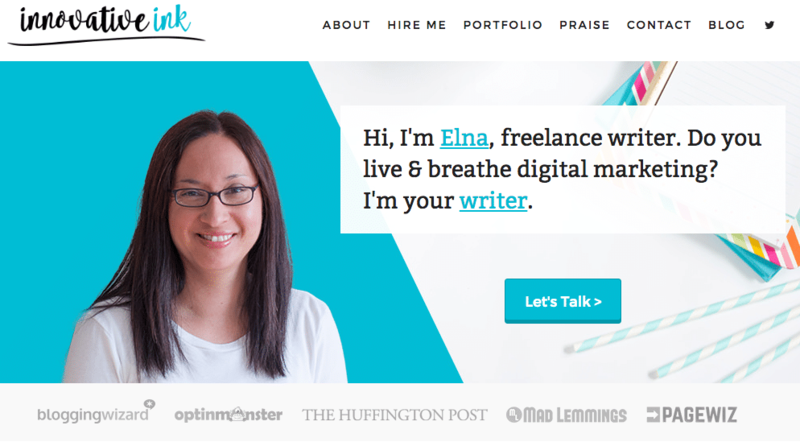 I use my website as a lead generation tactic to attract writing gigs! Prospects go to my About page and Hire Me page and read all about my service. Then they contact me! Some even visit my blog to see what I’m up to and if I’m an engaging writer or have followers. So, if you’re debating whether to have a blog or not, I say do! Start a blog today! Not every niche is a high-paying niche and not every writing service you offer is high-paying. But, there are a lot of niches out there that pay well and help you with writing for money. For example, the parenting niche CAN pay well (even though it’s an over-saturated niche). You just need to know where to look. Carrie Madormo is a freelance writer for parenting magazines (and medical publications) and makes a living from it!! 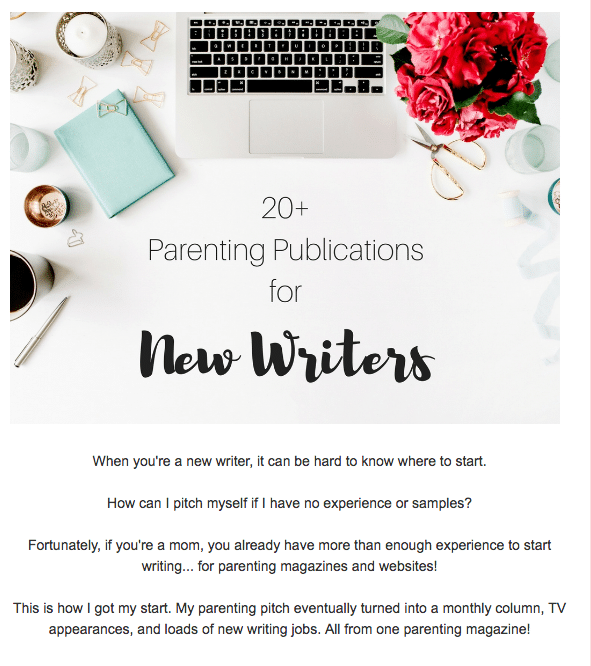 Check out her lead magnet about 20 Parenting Publications for New Writers! She found a way to write about being a parent on magazines that pay very well. Finding that high-paying niche takes time. You need to think about what products are out there based on a niche topic. For example, let’s look at religious studies. It’s hard for me to see a thriving business around this topic with products and services. But, this is not to say that you can’t be a writer for educational institutions about religious studies. Here’s another example: equine studies. This is mostly a hobby based topic, but there are a lot of products for horses and learning to ride. From this, I can determine that this is a profitable niche. So when determining your niche, not only think about what you enjoy writing about or your passions or hobby, but also think about how it can be monetized so you can make money fast. Now, this goes hand in hand with your profitable niche. Your client can determine whether your niche will be high-paying. Let me help you see this. When I first started out as a freelance writer, I marketed myself as a health writer and parent writer. I landed a health writing gig for $25 a post. Since I was new, I took the gig. It was bylined, and I was able to keep building my portfolio. A few months later, I was able to land another health gig. I earned $85 a post. Both of these posts were the same word count (500-700 words). Both posts were about health related topics. So, why did the latter project get me more money? The first gig was for a start-up business. It was a brand new company and focused more on their product and marketing material for local businesses than it really did on their blog content and lead generation tactics for online customers. The second client’s entire business was online. They had a health product that they created and needed help getting their product in front of more eyes. This meant they understood the importance of blogs as a way to create an inbound marketing strategy. This also meant that my content was much more valuable to their bottom line than my first health client. And this equated to make money as a freelance writer and more. For me, I try to stick with digitally native brands in the B2B market. I have to preface this tip by saying that when I first started my samples they did not relate to my niche topics. I was still able to land gigs. So, even though I was able to land gigs, I still feel that it would’ve been a helluva lot easier if I had samples based on my niche topics. 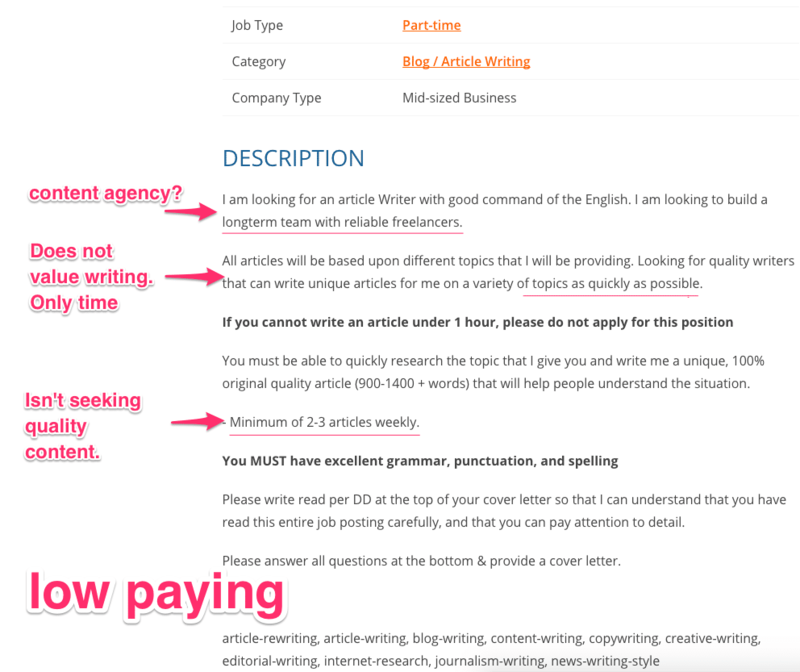 Quality freelance writing jobs nowadays really want a writer experienced in one niche topic. But, you’re a new writer, and that means you really don’t know your niche. That’s why I also tell new writers to pick a few niche topics to help you discover your paying niche. As I mentioned before, I chose health and parenting as my niche topics. But, what’s my paying niche? Digital marketing. I had to discover this niche. For me, I enjoyed learning about marketing for my own freelance writing business. I was then approached to write about social media marketing, and I was hooked. From there, I landed a blogging gig about…blogging. I love this niche so much that I ended up pivoting my mom blog Twins Mommy from blogging about being a work at home mom to helping mom bloggers become mompreneurs. My topics went from the challenges to working from home to how to make money using Pinterest or how to promote your new Facebook group. Once you find your niche, start creating samples around that niche topic. Since it took me a while to figure out my paying niche, it took me a while to create samples in my niche topic! So, the sooner you can figure that out, the sooner you can make money as a freelance writer! I get a lot of emails from my subscribers telling me that they aren’t on social media. Or that, social media scares them. I’ve been a freelance writer for three years, and I can see how powerful it is to be on social media. The more “you” are online, the more opportunities your future clients will see you. They may see your social media post on Twitter or check out your LinkedIn profile. Maybe an editor saw your Pin and wants to hire you for their content (that happened to me). Being on social media helped me grow my freelance writing income, and I can’t say enough about being on social media. So, how do you get started if you don’t know much about it or are scared? Don’t overwhelm yourself by trying to be on all the social media platforms. Start small and pick only two. I suggest Twitter and LinkedIn. Those two platforms have yielded me the most work. Go to Twitter.com and LinkedIn.com and create an account. Fill out your bio and description and make your copy good. Remember, you are trying to market your freelance writing business and attract clients. If you are specific, businesses can find you. 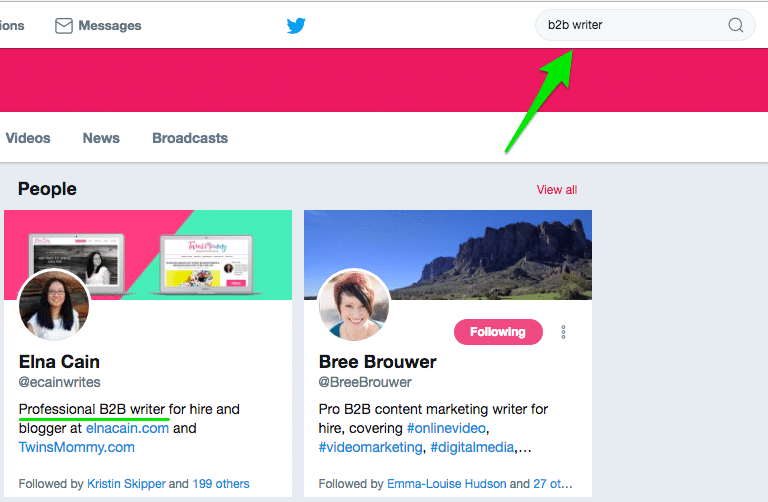 For example, here’s my search for “b2b writer” on Twitter. On social media, your image can sell you. Pick a professional image or create a headshot (you can use your iPhone) with a plain background and good lighting. Use this image on your blog and all your social media profiles. When I first started, I used an image I took on my birthday with my twins. A year or a bit later I took more professional pictures outside with a natural theme. I’m able to use these for a while since they are part of my brand. So, when you build your freelance writing business, you need to look at how you want to portray yourself. Do you want to be the fun and creative one or the serious one? Discover how you want to be seen online and show that in your headshot. One of the hardest things new freelance writers have is sharing some personal things online. They are afraid that someone will track them down and steal sensitive information. While this can happen, it’s highly (highly) unlikely. You can protect yourself online to stay safe. But there are thousands and probably millions of bloggers online that share their face and their story. You should be no different. If you want to build a connection with your clients you have to let them know you and see you. This means telling a story about you and your skill level. It’s also showing another side of you that isn’t all about writing. For me, I add some fun facts about me on my About page. You can also show your personality with your blog, your writing voice, and your images. Showing who you are and how you write can be represented in your images and brand. From the colors you use to the font you use to the images you use, your freelance writer website or your blog or your blog images should represent you as a writer. 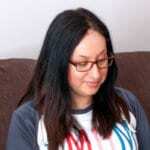 I have several blogs – Elna Cain, Twins Mommy, and Freelancer FAQs. Each one has a unique brand identity with its own colors and images. I spent a lot of time growing my brand and figuring it all out. So, it’s okay if you don’t have a brand image in the beginning. You can start with your voice. How do you stamp your content with your personality and vibe? Do you end in prepositions? Do you stick to certain words or style of writing? All of these represent you as a writer, and if a client reads your content and enjoys this aspect of your content, then they may very well hire you for their content. This can help make money writing. On social media, start following other writers in your niche. Also follow brands, businesses, and influencers that you admire, follow or want to write for. It’s important to network in this business. Why? Because it’s who you know, that can help you be successful. A lot of my work comes from referrals. My clients refer me to their friends and colleagues. Even writers refer me too! 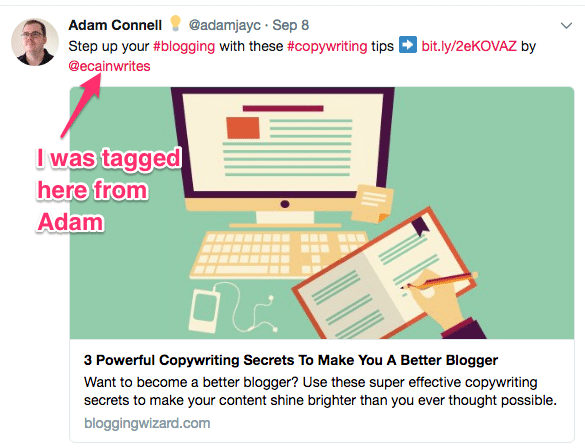 A pro-tip: Start linking to blogs of those bloggers you follow in your blogs. For example, if you follow Pam Neely you can find a content she wrote and link to that on your blog. Those bloggers will find out you mentioned them or you can tag them on Twitter. Once you start following others, it’s now time to share their content. Whether it’s on Twitter or LinkedIn, share other blogger’s content. Personally, what I do is comment on these posts first and then share them with my social media followers. I only share content that I’ve read and feel it will help my followers. The more connected you are to others, the more likely you will get referred and found out from people that need a content writer. It’s been awhile since I’ve actively pitched to jobs, but I do know one thing: you need to find the right jobs to pitch to. This might mean researching the company first. Or, it might mean looking at the ad and figuring out if it represents a good gig. For example, he’s a recent job ad on ProBlogger. And, here are the “red flags” I noted, making this an unsuitable gig to apply to (well for me at least). When a gig wants you to churn out content fast and a lot in a week (for my high-paying clients, I do a post a week or one a month for bigger posts), then it’s going to be low paying. If you decide to do cold pitching instead, then you need to figure out the right companies to pitch to. 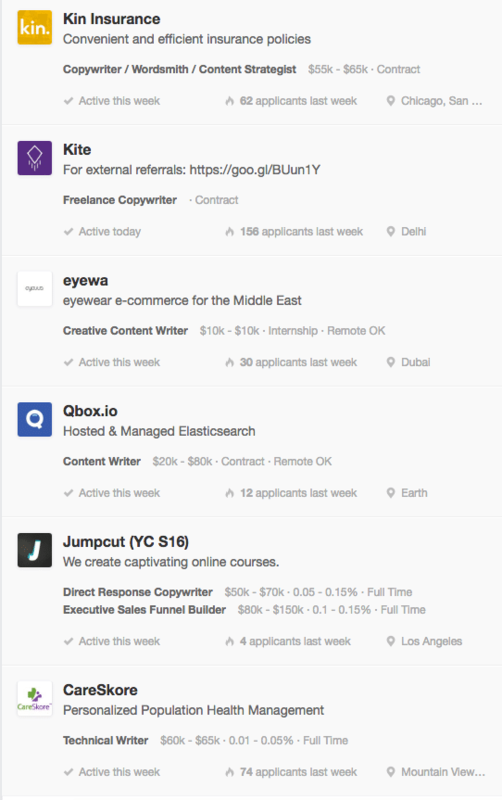 For example, you can go to Angel List and search jobs based on your niche topics. You first have to create your profile based on your social media profile (so make sure you use those keywords). From there, Angel List will populate jobs based on what they know from your social media profile. From here I can click I’m interested and write a little elevator pitch on why I’m interested in this gig. Before I created my Angel List profile, I was asked to download my LinkedIn profile as a PDF. This can be used for these companies to see if I’m a good fit. There are many other ways to find gigs to pitch to, so make sure you spend the bulk of your time finding these places or companies to pitch to. 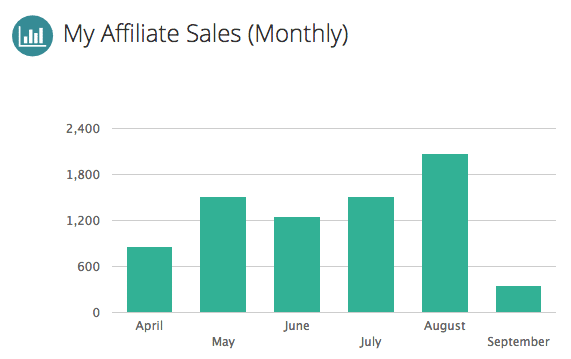 I started this post talking about starting a blog and monetizing it by doing affiliate marketing. This is one way to diversify your income. 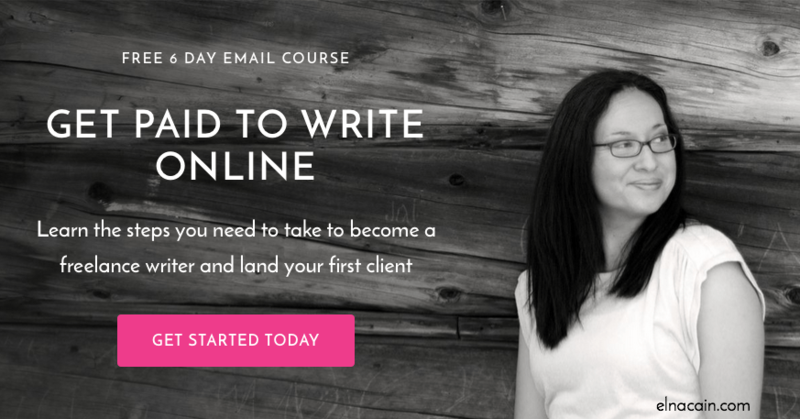 You’re going to want to do this step as freelance writing can be a roller coaster. There are slow seasons online, which means less content for you to get paid for. 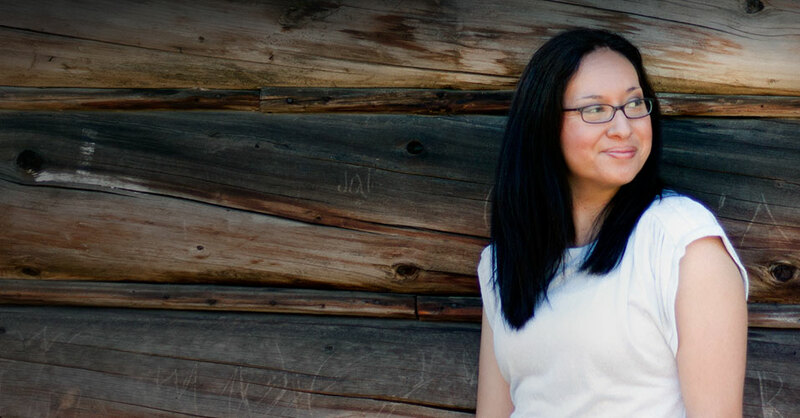 As a freelance writer and mom, I’ve built a consistent business with my blogs and my income. Check out my infographic to help you plan this out! Please pin me too! The one takeaway from all this is that you need a plan. If you’re working full-time you need a plan of action. You’ll have limited time, but you’re new and no one knows you yet. That’s it. Your job is to find a freelance writing job 🙂 And when you do, your job is to raise your rate and continue building your business. Let me know in the comments what you are doing or did to make money freelancing writing! Become a Highly-Paid Writer Today! I have been following your posts for around two months now and well i’m so grateful they’ve acted as my short course. You know am just starting out as a freelance writer and feeling like my niche is in ebook and novel writing but still wondring how exactly i can work with authors i hope you can advise on this. I also wonder if there is a possibility of earning any dime in my first month as freelance writer (even if its just $100) and what i must do to score this. Sincere thanks, your posts are so helping! I recently wrote a post on how to be a ghostwriter. The best ghostwriting gig is to ghostwriter books. This is highly lucrative! So try that out! I love writing. Had a WordPress blog sometime ago but did not follow through. I want to get back sharing my love for writing as well as monetizing my passion to write. How do I do this? I am a novice and I’m not very tech savvy either. That’s awesome. I love how you didn’t give up and you want to try again. The process to become a freelance writer varies depending on you! I suggest you start a blog and create samples 🙂 From there you can use job boards to secure work! I am new to blogging . I started my new book blog 6 months ago but I have not been able to monetize my blog. I need your help on how best to monetize my blog. Thanks so much! One way is with affiliate marketing or offering an eBook or course. Those are better ways than using ads or sponsored content. My other blog, TwinsMommy.com has resources to help bloggers earn money blogging! I’m a mother of 5 looking into blogging an freelance writing so I can have more time at home. I have been researching all about it.. I have a question, I can’t really find a niche.. I love and am very passionate on several areas an they are so different from each other.. How would I go about doing that? Do I need to set a blog for each, or should I put ” Diversified freelance writer blogger” ? Here is my email [email protected] thank you so much for taking the time and reading this comment. I have subscribed to your page. That’s awesome you want to be a freelance writer. 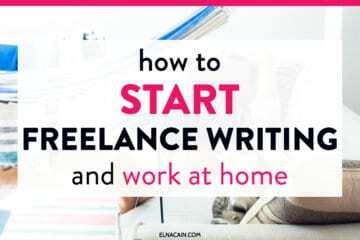 That’s the reason why I wanted to start – to stay home and work at home as a freelance writer! As for your niche, you may have to write in several topics to see which one(s) you really enjoy + look at job boards to see if there is a market for that type of content. 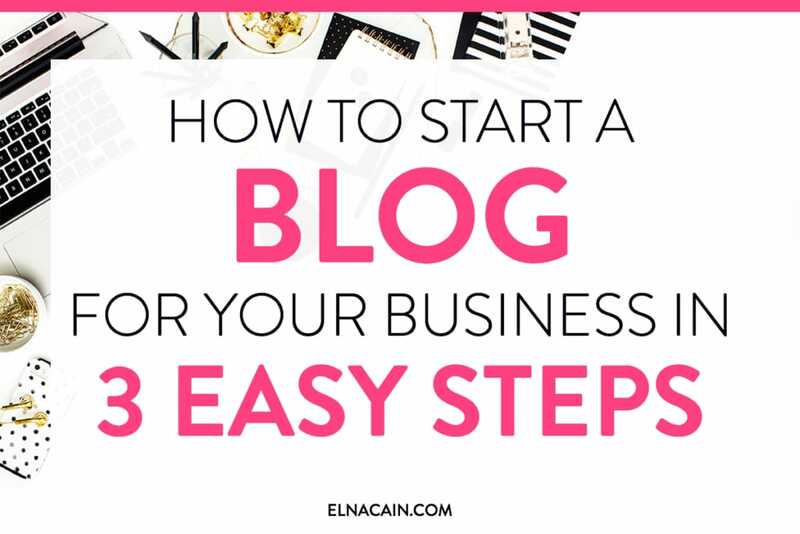 As for setting up a blog, this post can help you get started: https://elnacain.com/blog/how-to-start-a-blog/ There is a video too! On your blog YES! 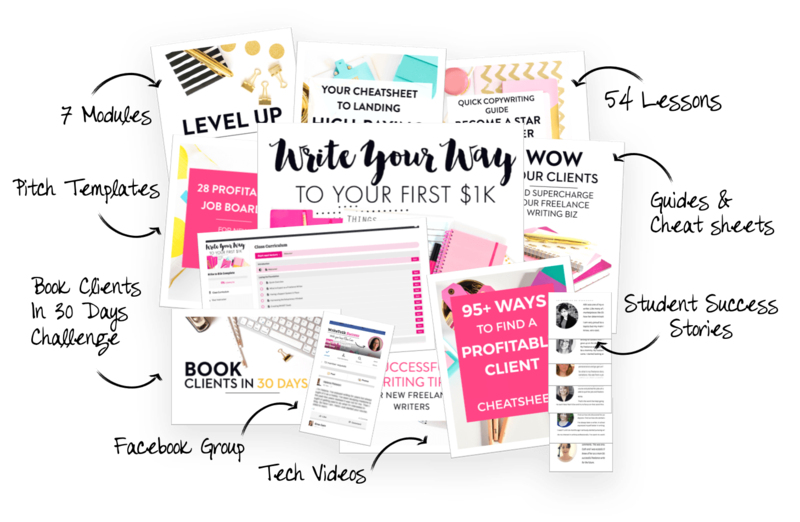 Put what you do – Freelance Blogger for Hire. I wouldn’t emphasize “diversified.” Businesses want an experience writer in one main topic. But, it’s okay to have a few niche topics on your blog like health, parenting and education! I came across your site when I was making a research on making money from freelance writing. The info you shared here was very helpful. I even had to head over to your other blog twinsmommy.com. I found a lot of the articles you wrote very interesting and helpful too. I noticed from one that you changed the domain name of this site to elnacain.com sometime ago. I wish to ask if the change affected your site’s SEO ranking after you made the switch? If it didn’t, can you please let me in on how you were able to do it successfully. I am asking because I want to change my domain name but most things I have seen online tell me my site ranking will drop badly. Thanks for visiting my other blog Twins Mommy! When I switched the domain I did a 301 redirect and it had no affect on rankings. A year a later I switched it to https and did the same thing (a 301) and it also had no effect. But, when you switch your domain make sure you do a search and replace in all of your posts to your new domain as this isn’t automatic. Hi, I’m interested in freelance writing, but my plan for the future is to be a full time mom as well. Is it okay to have only a few clients? I like to have free time, so I’ve been looking for some at home jobs that I can make my own hours with. Of course! You take on as many clients as you want. Right now, I only have ad hoc clients because I’m expanding my business to other areas. So do what’s good for your situation! I’m trying to figure out the best way to start Freelance writing, but I’m not sure if I have the background needed. I have a LinkedIn profile, but all of my experience is in the service industry. I love writing, and know I’m more than capable of building a career doing it. However, do you think it would be a good idea for me to have social media accounts that do not list my service experience? As in only advertise examples of my writing? I loved your article by the way! That’s great you are interested in becoming a freelance writer 🙂 I suggest to writers to create social media profile just for your writing. So have a new Twitter account promoting your writing services and try to create a writing service LI profile. This will help you look more credible to prospects! I am about to retire and want to begin writing and getting paid for it. I have been published several times, but have yet to see a cent. This time I want to use the internet and get results. I am scared, because I do not have much experience on the internet. I write realistic fiction, poetry and short stories. What can I do? I think for you, you need to be more comfortable being online. Read more blog posts and check out online magazines and from there search for guest posting or magazines that pay freelance writers. I personally help those that want to become a freelance writer, not an author. Maybe try WritetoDone? Really helpful for me. I was write for my blog myself, but most recent time I feel boring as a writer. That’s why I am going to outsource for my site. Outsource is expensive for me. After reading your article I found back my hidden confidence. Will try to write again. Thanks for sharing the best steps for writers. Super, super helpful, Elna! Your site helps me move forward. The first month of freelancing can be a bit dark! Thank you so much! I love hearing that you want to be a freelance writer. Thank you for following me! Loving the info on your site and the $0-$1k course. Hi Elna, how are you. Thank you for this post. I’m a blogger, not that established ,just started the journey. You have shared some very useful tips. Which i think beginners like me finds very useful. Glad you found some good tips. Thanks for sharing this article. You have mentioned so many useful tips here. I am trying to make a career in writing but never knew how to monetize it, but after reading your article i now feel confident. Glad you found some tips to help you make money as a writer! Thank you for sharing. My super power has been social media in this journey of freelance writing. I discovered that not many freelancers are paying adequate attention on how to use social media to grow their client’s blog, so I took it up. So far, it’s been working perfectly. Practically, there’s a limit of client one can attract if he or she doesn’t have a blog. Blog make gigs come to you. Also, it makes it easy for a freelance writer to quickly diversify. Great point! You are right; not many freelance writers are using social media to grow their income! Would still love to see your take on what a decent job ad might look like though! 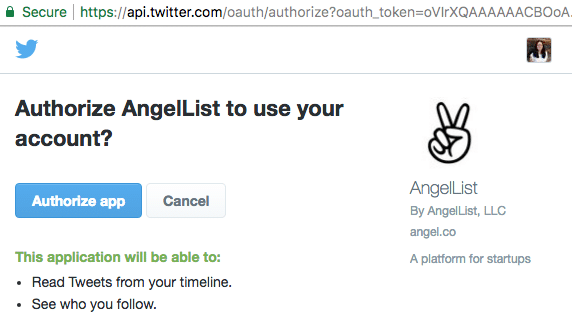 Thanks for sharing the info about Angel List! It didn’t ask for my LinkedIn profile so do you recommend filling out the profile page completely if you’re looking for freelance writing work and not a full-time job? The page asks for your prior experience and education, just like a resume would. Also, I really appreciate the analysis of the job ad from Problogger. Will be super helpful when looking at job boards. Do you by chance have any examples of what a potentially good job ad could look like, from your perspective? That was so amazing to read. The above-mentioned points are practical and really important if you are taking freelancing as your career. Many people consider freelancing a source of extra income or a side business but they never understand the possibilities if we scale this up. Thank you so much for sharing. Some of the points are applicable to almost every freelancer. Thanks so much for stopping by! Yes, making money as a freelance writer can be a challenge. I hope this helps you! In Point 5, Step 2, you included an image. What platform is that from? That’s Twitter. I’ll mention that in the post. Thanks! Thanks for sharing this useful tips because everytime thinking to start a blog but after reading this post I will surely start within a week. You’re welcome. 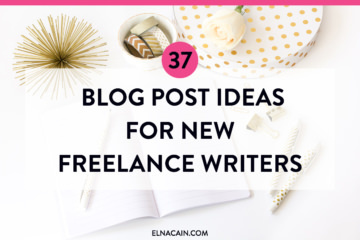 Glad you found some tips to help you make $$$ as a freelance writer!